Making chocolate is an art. Artisan small batch chocolate makers create the lucious dark bars we all love so much from scratch. They start with roasting cocoa beans, crack them into nibs and winnow the lose shell. Next, the nibs are ground them into a cocoa mass. Finally, by conching this mass, the flavor profile is refined. Before molding the chocolate, the producer has to make sure the right type of crystals by raising and lowering the temperature of the mass following a specific and controlled procedure. This way, the final chocolare bar will be nice and shiny and has a good snap. Many people who are interested in fine chocolate will surely have heared about these steps. The way a chocolate maker masters and performs these steps define the quality of the end result, both in flavor and appearance. However, the skill of the chocolate maker isn’t the only factor contributing to the quality of the chocolate. Long before the producer starts making the bars, a very important step has already been taken. The pretreatment of the cocoa beans. Just as critical as the work of the chocolate maker, drying and fermenting of the beans determines the end result. Yet few people know about this part in the proces. Cocoa fermenting is usually done on the farm where the cocoa is grown. Cooperatives might have central stations who gather and treat cocoa beans from different farms. The knowledge of the fermenting proces has a big impact on the quality of the final cocoa bean, ready for chocolate making. But why do the beans need to be fermented? Believe it or not, but cocoa beans weren’t put on earth just for making chocolate. The beans are the seeds of the cocoa tree. They grow in cocoa pods and are covered in a white pulp. They offer the perfect conditions to sprout, including all the necessary nutrients to allow the new cocoa tree to grow and thrive. Give the beans half a chance and they will sprout. The cocoa bean contains a lot of harsh, bitter and astringent flavors. Chocolate wouldn’t be half as good if it weren’t for the fermentation proces. Fermentation is done using different techniques, but they all follow the same basic principle. The beans and pulp are harvested from the cocoa pods and they are gathered. When being in contact with air, the pulp immediately starts fermenting. The sugars in the pulp are turned into acid vinegar and penetrates the bean. The temperature in the heap of cocoa beans and pulp rises quickly to 48°C (122°F). The combination of the acid and temperature, kill the bean and stop it from sprouting. Once the bean is dead, the chemical reactions in the bean change and the harsh compounds are eliminated, leaving more favorable notes. Fermentation has to be controlled though. If allowed to endure for to long, the flavor notes will pass their optimum and bitter compounds are formed. It is not possible to erradicate these over fermented flavors in the chocolate making proces. So fermentation is very necessary, yet also a critical proces which has to be followed closely. It is clear that a good knowledge of the proces is vital to obtain a quality primary product for chocolate making. This lengthy introduction is meant to inform you in brief on a factor hardly ever talked about by chocolate makers. Yet a few do go beyond what is typically done. Ara Chocolat is one of the few chocolate makers who have produced bars which inform their clients on this specific subject. 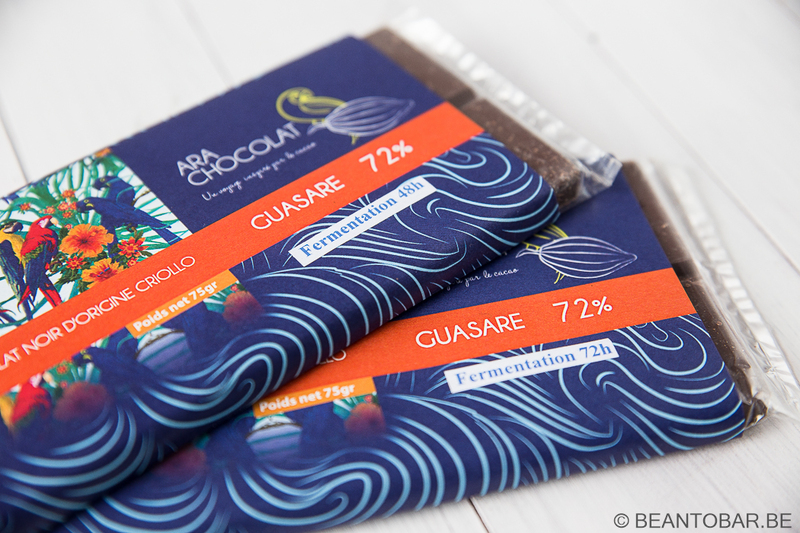 Today we look at two of their products, both Guasare bars, but with different fermentation durations. People who follow my blog will have encountered the name Ara Chocolat before. Based in Paris, Ara chocolat is an award winning bean to bar chocolate producer who focusses on Venezuela and other South American origins. Andres Zakhour and his wife Sabrina Trillos, both Venezuelan themeselves, create wonderful tablets and pralines in different shapes and sizes. The whole idea of two bars with a different fermentation time is highly exciting. 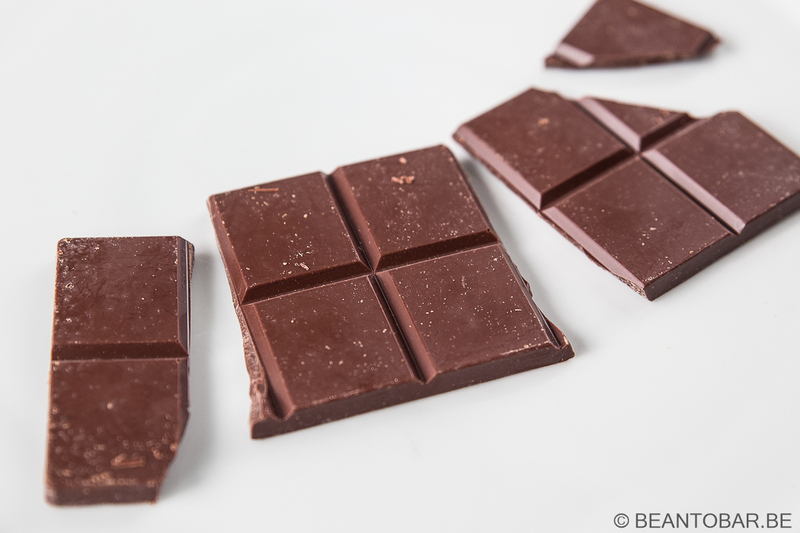 It offers once more a deeper view on the complexity of fine chocolate. However, there is more than meets the eye. I’ve requested more info from Ara Chocolat and they informed me the two bars do also differ in roast and conche. This makes it harder to link the fermentation directly to the end result, but still it is great fun to sample the two bars side by side. 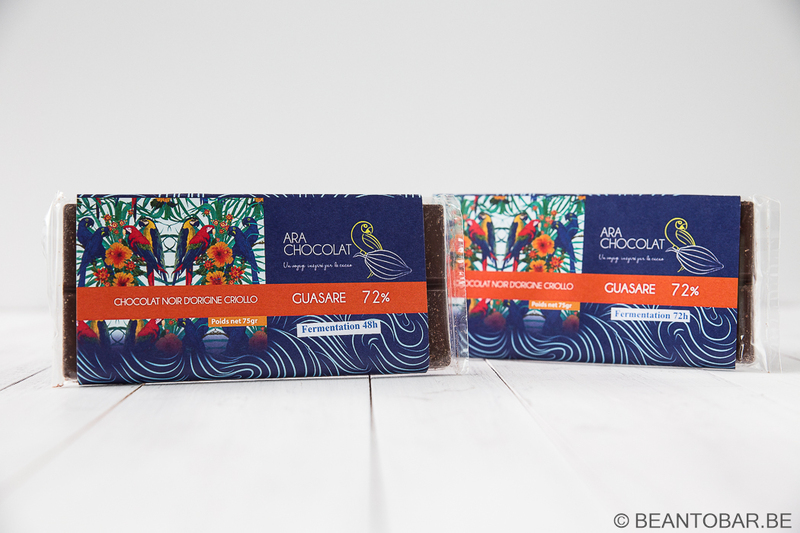 The Guasare mentionned on the package isn’t an origin, but rather a cocoa variety. It was discovered as one of the purest Criollo strains in Venezuela and if well fermented, offers a higher complexity than Porcelana cocoa. Taste: The bar starts off sweet with lots of roasted hazzle nuts – almost like a praliné – espresso coffee tones flow underneath. Brown sugar, rum and caramel mingle in. Followed by even more nuts and a hint of yellow preserved fruit without any acidity. The flavor is refined and well rounded. Contains some woody tannins in the back of the mouth, creating a slight bitterness near the end of the melt. The aftertaste concentrates on chocolate and once again loads of roasted nuts. Colour: some shades lighter than the 48h version, almost like a high percentage milk chocolate. Taste: starts of with a roasted grass flavor, followed by a flash of fruity acidity. Grapefruit comes to mind. Waves of deep chocolate come forth. Less sweet than the 48h version, this bar packs high tone notes. It feels lighter on the palate. A honney sweetness subdues the fruits. Near then end of the melt a flash of caramel rolls in and surprises you with an unexpected turn. There is a dash of woody tannins at the end as well. The aftertaste is lighter than the 48h version. The two bars have a distinct difference in profile. The 48 h fermentation bar is has round and mellow flavors. Slightly sweet and warm hearted. The 72 h fermentation bar sings in a totally different tone. It is more vibrant, fruity and has a darker core. Personally I prefer the latter. It goes perfectly with my love for hi-pitched chocolate bars who let vibrant fruits sing and keep you coming back for more. The 48 h bar feels more like an evening chocolate. It is soothing and relaxing, sweet and nutty. I was surprised by how far these two bars are apart on a flavor level. The base noted remain equal, especially the caramel tone found in both bars. They express a total different character nontheless – which means it is great to taste them side by side. 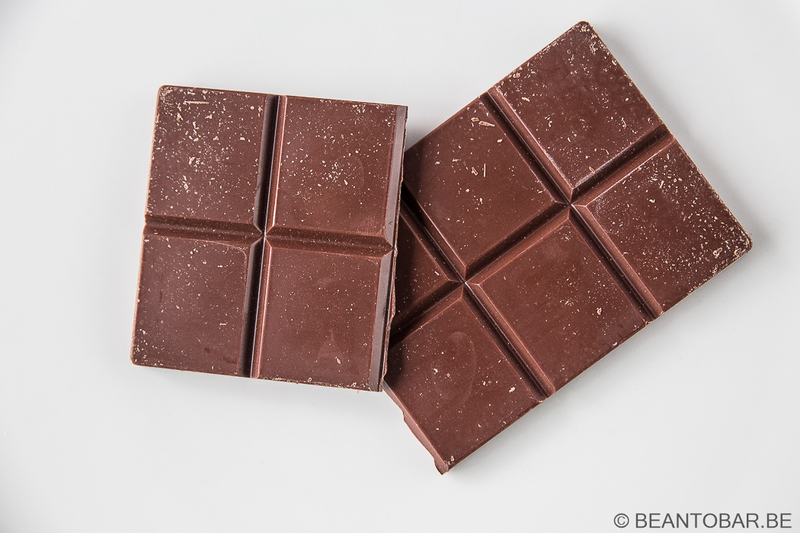 If you ever need to explain somebody about bean to bar chocolate, these two bars alone would offer them the chance to experience what a difference cocoa in fermentation and rhe production proces can mean to the final bar. Sources: cocoa fermentation is a very specific field of study. The brief explanation of the proces described here is based on information found in the book “The new taste of chocolate” by Maricel E. Presilla and the very informative blog pages about fermentation on the website of Amano Chocolate.